I found this picture on The Star's Citizen's Blog posted by a blogger called aleslpy. He thinks that the motorcyclist is being irresponsible. That may be so, but the thing that comes to my mind is that this picture is a reminder that Malaysia is a third world country, despite the claim to being a developing country. I lived in Vietnam for 2 years in the mid 90s, and several people on a motorcyle was a common sight. In fact, it was one of the more amusing sights when I first arrived in the country. The motorcycle is used to transport all kinds of things, and the Vietnamese are ingenious enough to rig their motorcycles in such a way that they can be used to transport the most unlikely things .. a slaughtered pig, stacks of baskets, a refrigerator etc. In the last several years the sight of more than 2 persons on a motorcycle is becoming common in Malaysia. My conclusion is that either more people can afford motorcycles and therefore choose to take their family on the motorcycle rather than take the bus, or there are more poor people living in the major towns who can only afford to own a motorcycle. It bothers me a lot when I see young children riding pillon on motorcycles, and especially the sight of a mother with a baby riding pillon. I know to them the motorcycle is most convenient but it is not necessarily the safest mode of transportation especially on busy roads. In America, motorcycles with small engines are not even allowed on the highways. As it is, there is an increase in road fatalities involving motorcycles. Riding big bikes is getting to be a popular sport among people, both young and old. 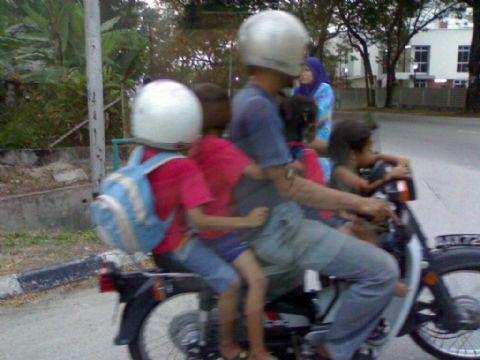 I think Malaysia needs to do more to improve public transportation so that people do not need to resort to transporting their whole family on a motorcycle. And also, the prices of cars need to be lowered a lot more from their present inflated prices so that more people can afford cars. Cars are no longer a luxury, they are a necessity. The prices of used cars in Malaysia are simply ridiculous! The prices should at least be within reach of the lower income group, and I am not even talking about junky cars. We have among the highest prices for cars AND gas. With car & gas prices so HIGH, and the average income so LOW, a lot of people are forced to buying medicore cars (i.e. 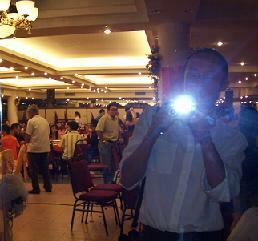 u know, the national "Prides") and paying up to NINES YEARS for the loan. I foresee this will 'kill off' a lot of people with average incomes who bought new cars this year, as they won't be able to afford to pay for the upkeep of the cars, much less for the loan itself. In Miri, the situation is far worse, as everything is transported from far away and this imposes a price hike in everything of necessity. Businesses have no choice but to increase the prices. Those who can afford the products and services are unhappy with the increases, and prefer to resort to buying the same products or services elsewhere (like in Kuala Lumpur) which are much cheaper - because simply there is not much transport fee imposed. Doh. A friend of mine there reported that KL is facing more or less the same problems - so by comparison, how bad are we facing? How about to those living in the rural areas? What you're seeing is the beginning of a real drain on the Miri economy unless the 'higher ups' realise this and take action. "World market oil price increased! We can't do anything about it!" Ian, thank you for your input. As I ended up that entry I was thinking exactly what you were thinking .. even if cars become affordable, what about the car insurance, road tax, the gas? Owning a car would still be out of reach for most people. Wage/salary increase in Malaysia lags so far behind the increase in prices of most essential goods .. even the middle income group is feeling the pinch, what more to say the low income group? You can get a good running used car for a few hundred dollars .. even the Honda Accords (old model lah). Anyway, every time I think about buying a new car in Malaysia I keep thinking about how much less I would have to pay for the same car in the US. I just don't feel like shelling out that kind of bucks for a car! Yeah, that is the reason why a lot of people still stick with 10-15, even 20-25 year old cars, even restoring them and fixing them up, because the threshold for how much it is worth in cost of maintaning an old car vs. buying a new car is still so far apart, it is much more logical to keeping the old one! Why not use public tranport? Well, the costs shot up so high, it is actually much more worth it to get one of those unsafe tiny medicore cars. hey, I didn't notice the error coz I knew what the word was supposed to be! About the price of the car, if i were not mistaken, only the imported car are sells at the higher price while Malaysia car price already cut down up to 15 percents. Regarding the public transportation and the reasons of why their fees are so high is because the maintenance. Before, i was made an interview with our local bus driver and found that, most of their company are no longer subsidised by the government. And what make so shoch why they have to rise their fees even they provide the worst services is due to their internal conflicts of interest. regardless of 15 %, 20% or even 50%, cars & fuel prices still cost too much in Malaysia as compared to the average income to fully offset a purpose of a car. Therefore, to own a car (no matter what model / brand) seemed like a luxury. What if the prices of cars are low enough to be affordable, will it still be a luxury despite the high cost in gas prices? Gas prices in Malaysia are still subsidised and therefore not that expensive compared to prices elsewhere. I think Malaysia as a whole needs to do something about raising income. Income levels in Malaysia, generally, have stayed stagnant for too long .. not in keeping with the constant rise in cost of living. The sad truth is that any increade in income would be a problem in itself because businesses would raise their prices of goods/services and when all is said and done, people's disposable income will be back to square one. Malaysia should get out of the car manufacturing business. It does not have the economies of scale to make it competitive. As it is because of one man's dream of becoming an industrialized country, we the people, are paying too much for a little car which should cost no more than RM25,000. In the name of protecting our home made car industry, we have to pay through our noses for cars .. the ownership of cars that should no longer be a luxury. One of my friends here recently ran the red light and crashed into someone .. she said her car was "totalled" .. so she got herself a brand new car as replacement .. seems that her insurance coverage was good enough for her to be able to get a brand new replacement. Would that happen in Malaysia? We'll have our car repaired and it would be as good as new. Here in the US, it costs more to repair a damaged car, and cheaper to just get a new one. I actually felt for that photo of man carriying his family on, a bike. I've seen lot of similar pictures on local newspaper, which reader made the same lame comment, irresponsible motorcyclist. It is sad that fellow Malaysian failed to understand their own kin. We always introduce Malaysia as multi-everything country but it's not merely about race, food and culture. Not only that three main races, not only that drive-a-car and everyone-can-fly way of life. Malaysian has spent too much time understanding and learning or adapting other culture that we totally lost initiative and urge to understand ourselves. And that irks my a lot. It irks me to see some Japanese comic character or Marvel Hero in school painting competition but not of Lat or Ong Wah Peng. It irks me to see thousands attending O-bon festival in Shah Alam but many of them couldn't tell the differece between Yukata and Kimono. It irks me to see Velu sneeze in front of Ahmad but apologize to Jean-Marie, behind. I think one reason why Malaysians especially the young want to emulate the "lifestyle" of other more developed countries, is that they think they are up to date, hip, world-wise. In fact I am very surprised to hear how widespread the American slang (like "Valley Girls" expressions) is among young Malaysians. Maybe I am out of touch, or it is just my age, the people I mix with do not speak like that.